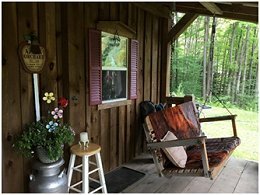 Willow Creek Cabin Rentals, located on 2060 W. Washington Street in Bradford, Pennsylvania, has three cabins with plenty of space for large gatherings and camping fun. While staying at Willow Creek Cabins you can enjoy year-round outdoor activities, such as world class fishing and hunting, hiking, sightseeing, or riding ATVs, UTVs, and snowmobiles through the forest. All cabins include a TV with a DVD player. This is an Internet and cellphone service free zone. Enjoy the peace of nature without the noise of technology. A reasonable amount of wood is included for each fire pit, and more wood is available for purchase. Propane grills, charcoal, and a canoe are available. Book your cabin by calling (814) 363-9773 or message Willow Creek Cabins on Facebook. Pay with a credit card upon arrival or in advance by phone ($50 refundable flat pet deposit). Discounts are available for large groups, events, and church retreats. Check in time is 1:00 pm. Check out time is 3:00 pm.